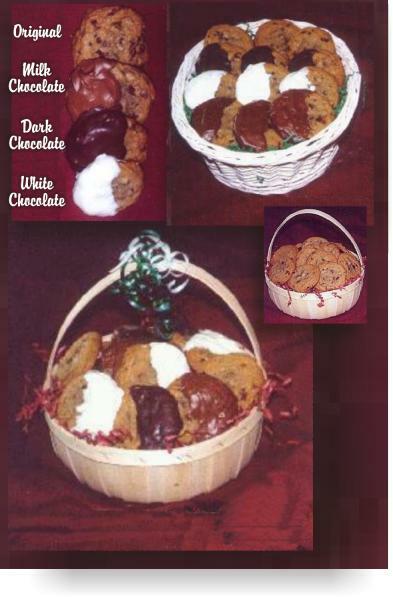 "Aunt Eweyes bit 'o heaven super moist chocolate oozing wonder bursts"
Now you can see why we don't have names for the cookies we sell - they'd never fit on the box! All Cookie Prices Include Shipping! Everything we offer is shipped to arrive wonderfully fresh and delicious nationwide. Try our Variety Dozen. Three of each kind of cookie. By the box it's only 34.99 by the basket it's just $39.99! So how come it's a bit more to order our variety packages? Glad you asked! Remember...we do everything by hand and fill each order individually. We won't make big batches and let them lay around till someone wants something. So the variety pack takes us a bit longer to create. Got it? Good!